Derry and Tyrone will contest the Dr McKenna Cup decider after winning their semi-final encounters on Sunday. A Ryan Bell penalty helped the Oak Leafers to 1-17 to 1-10 victory over Cavan at the Athletics Grounds. 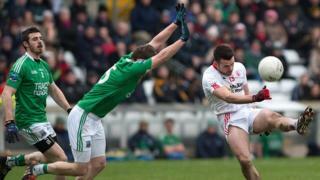 Tyrone remain on course for five straight McKenna Cup triumphs thanks to a comfortable 1-13 to 0-9 win against Fermanagh.